Kosmonaut. Photo by Elspeth Moore. 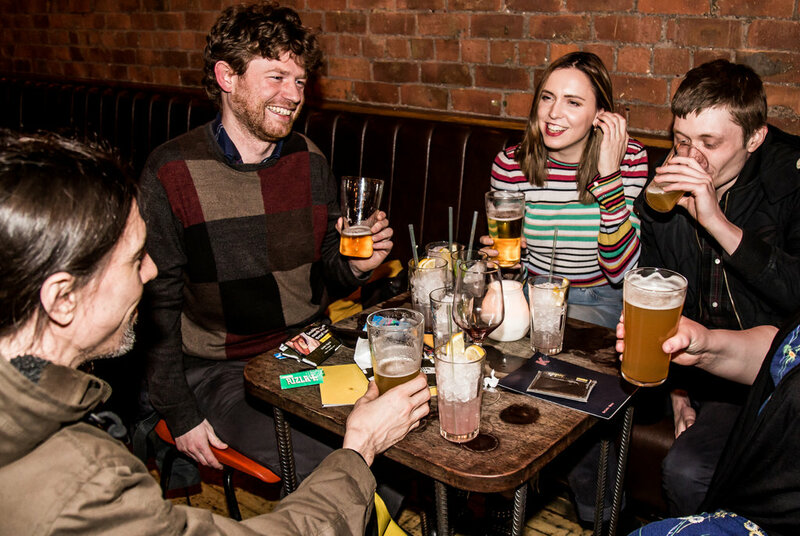 Kosmonaut has introduced an extension to Fat Tony’s menu – a new Quizmonaut from Tuesday 3 April – and you can still have a full roast on Sundays with a DJ spinning some tunes! 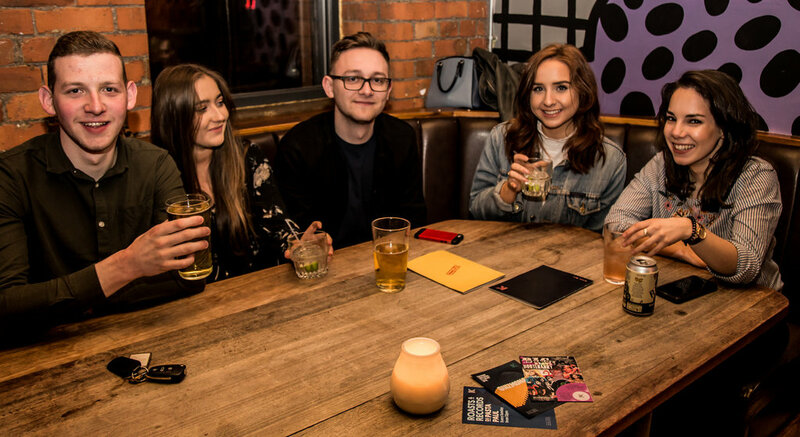 The new Tuesday-night general knowledge quiz will cover a massive amount of genres with even bigger prizes – it’s £1 to enter and features Happy Hour prices all night long on drinks from 6pm! 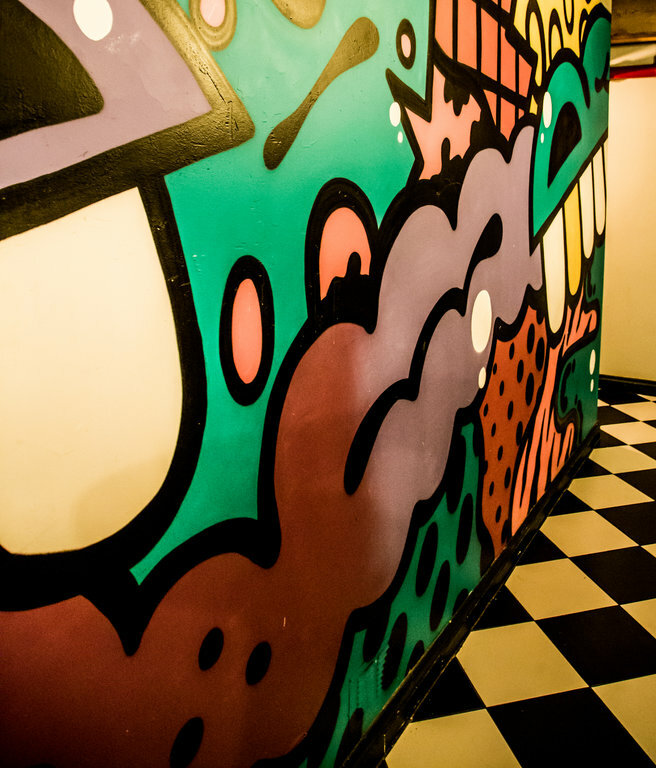 Kosmonaut is on Tariff Street, close to Piccadilly, right in the centre of Manchester, but once you walk into Northern Quarter you could be in another world, a world that has provided a backdrop for films and television shows such as Captain America, Alfie and Peaky Blinders. 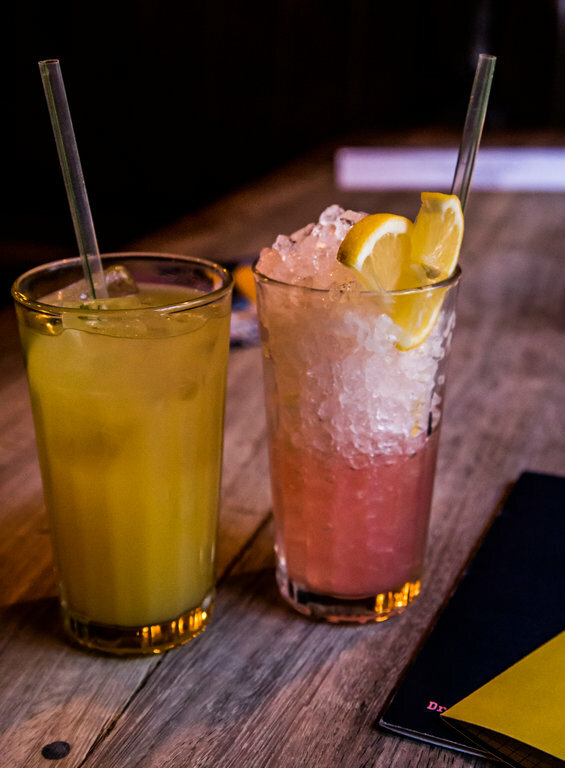 Kosmonaut first opened its doors in August 2012 and has a laid back, artistic feel, inspired by the bars in NY’s meatpacking district. 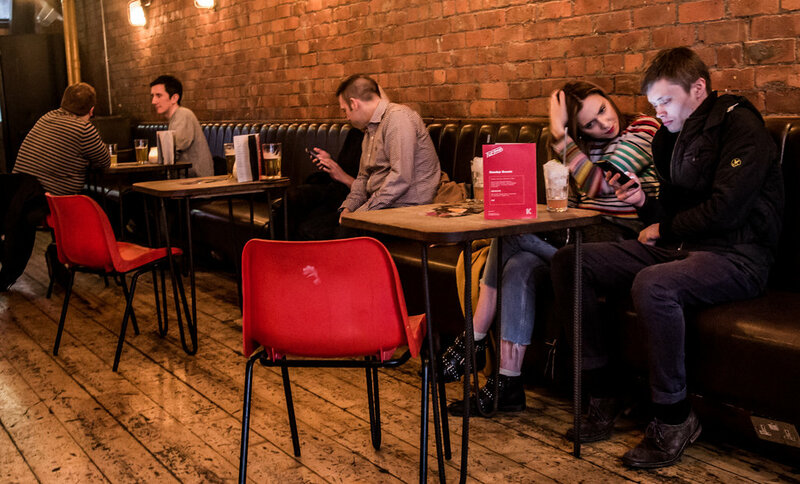 The bar top and tables are graffitied from their days in school science labs and the light fittings imported direct from derelict communist factories. 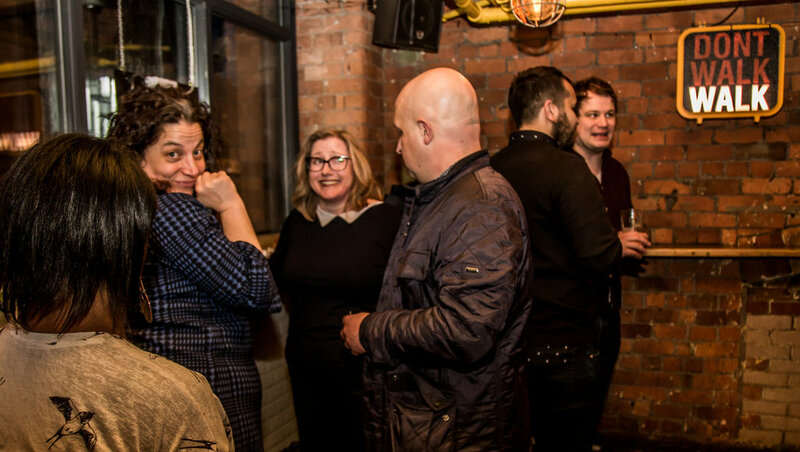 Its diverse offering was awarded Manchester Evening News City Life’s Bar of The Year 2013, Design My Night Manchester’s Best Bar 2014 and a nomination in the category for Best Bar at the Manchester Food and Drink Festival Awards 2013. 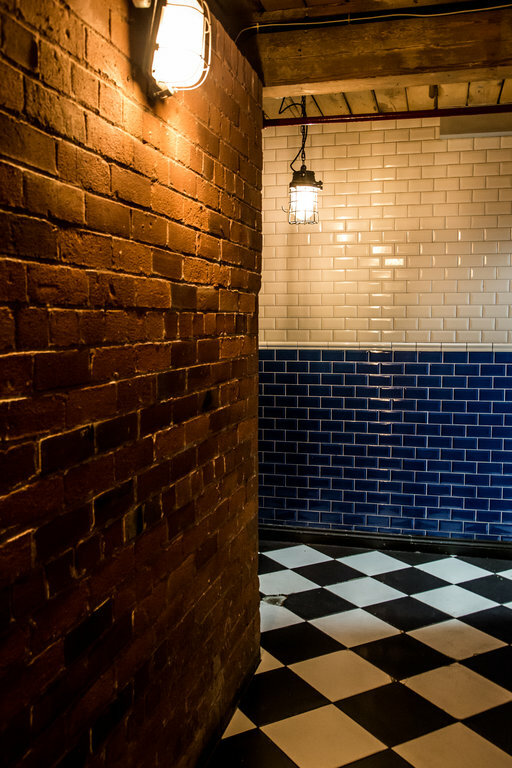 We walked through the packed bar with its stripped back red brickwork, bare wooden floors and an American Walk Don’t Walk sign on the wall, into Fat Tony’s lair with bright graffiti-style pop artwork running down the wall (it’s dry now, no fumes), and you may spot an occasional Coronation Street star. 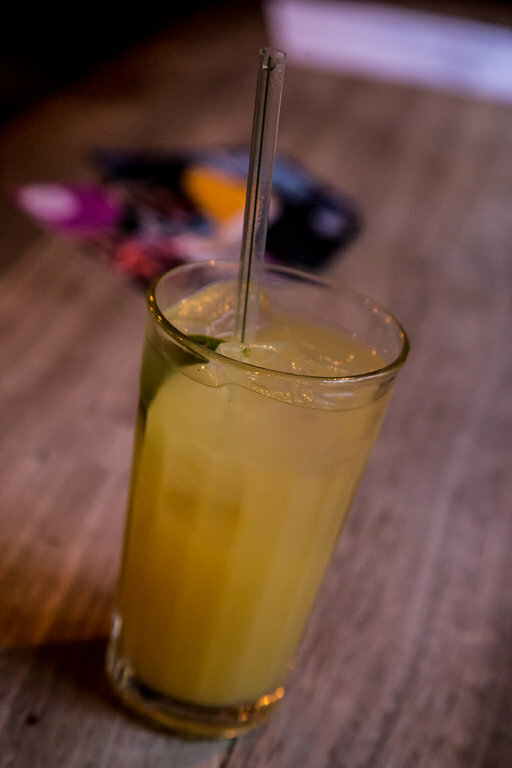 There are parking spaces with parking meters outside, close to the front door, but the proximity to Piccadilly trains, trams and buses means you can leave the car at home and sample the cocktail menu. The Make Love Not War cocktail sounded delicious – gin, elderflower, strawberry and lychee – and it was. It looked like everyone on the table next to us had opted for that as well. So delicious it didn’t last long. Other cocktails were Party Juice; Along for the Ride; Rumbongo Banana Colada; Late Night Date Night; Superfly Sling; Gooseberry, Fool; Banjos at Dawn; Mexican Medicine and Verdita Margarita. 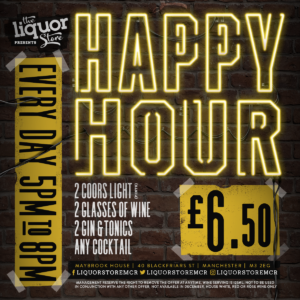 Then there are the Refreshers – vodka and Manchester’s very own Vimto; Bourbon Cherry Coke; and Ghetto Mojito. 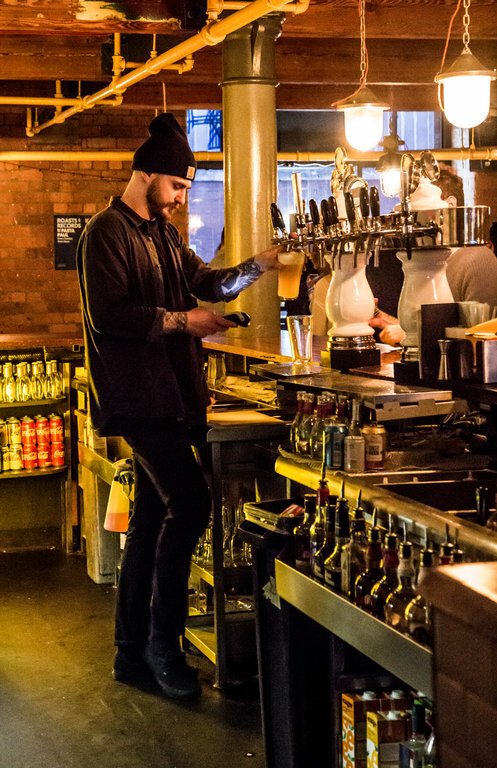 There’s also a fine selection of artisan beers, in fact over 200, with a rare and independent selection to rival any in town, from Flying Dog Ales to Weird Beard Brew. 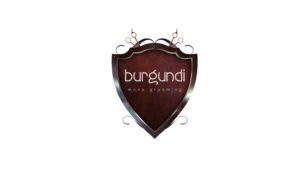 Watch their social media for more updates on new additions to the extensive menu. The Burger section has been given a makeover and now you can get the beef burger (£10) with relish and smoked Applewood cheddar, the double bacon and cheese burger (£10) with crispy streaky bacon, melted cheese and American mustard, the second beef burger (£10) option this time topped with with blue cheese, steak, caramelised onions and mustard, the buttermilk chicken burger (£10) with winter slaw and chicken gravy or the chilli chicken burger (£10) topped with jalapenos, sour cream and cheese sauce. Sweet potato burger with halloumi, crispy shallots and harissa mayo. Photo by Elspeth Moore. 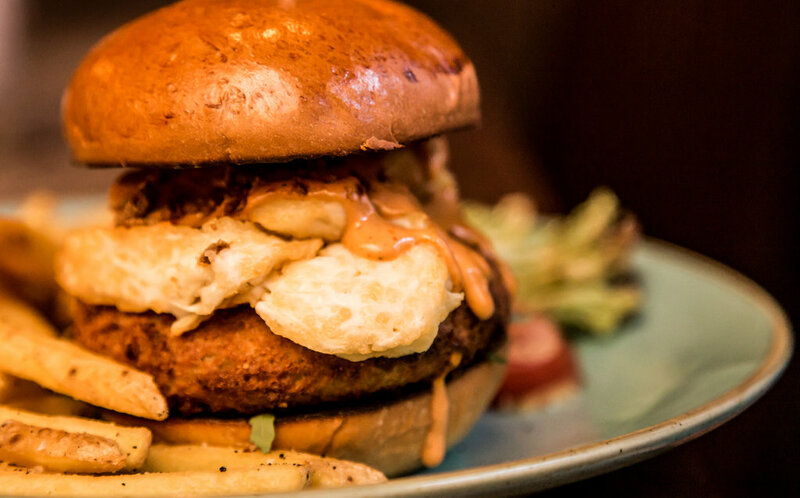 As I don’t eat meat, I chose one of the veggie options – the mouth-watering potato burger (£10) topped with halloumi, crispy shallots and harissa mayo, pictured above. It tasted as good as it looked. It was so big there was no way I could eat it as a burger and had to cut it in half. Fat Tony also offers another potato burger (£10) option with wasabi mayo and Asian slaw, which also sounds fabulous and it’s good to know that there’s more than one veggie option. I love halloumi and I was delighted to see there are also halloumi fries and halloumi salads, ideal for daytime or nighttime snacking. Viva photographer, Elspeth, had the buttermilk chicken burger (£10) with winter slaw and chicken gravy, which also went down a treat. See below. All the burgers are served with fries, salad and pickles. The plates were massive so you don’t need to order any sides. The chips were covered with pepper, which I loved, but if you’re not a fan of pepper then remember to mention that. 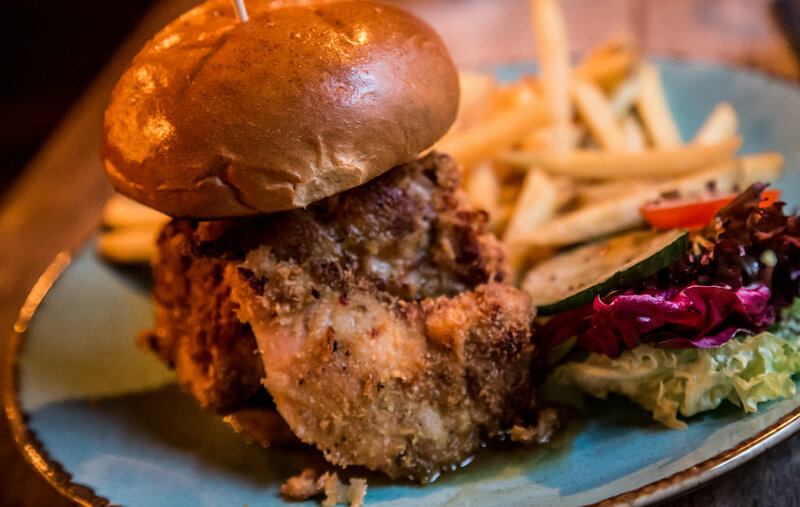 Buttermilk chicken burger (£10) with winter slaw and chicken gravy. Photo by Elspeth Moore. 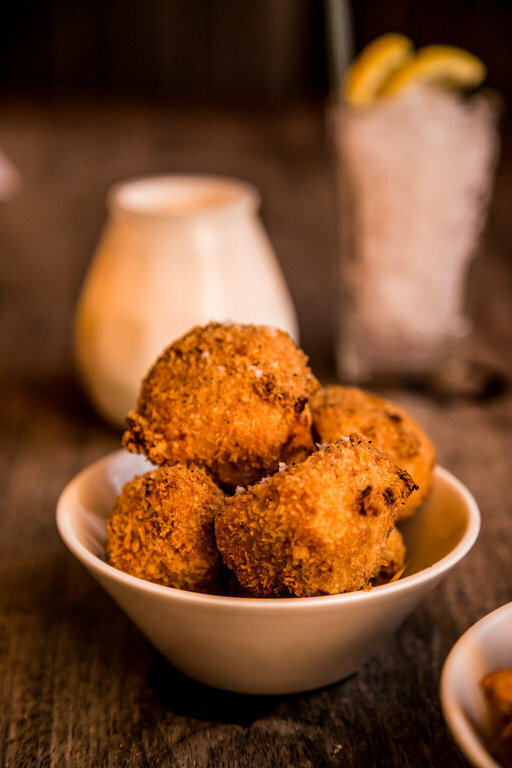 Brand new to Tony’s menu are the Small Plates with fried cauliflower (£4), the hot wings (£5), the barbecue wings (£5), croquettes (£4), truffle mac & cheese (£4) or the baked cheese (£5). A full section of poutines has been added to the new menu. 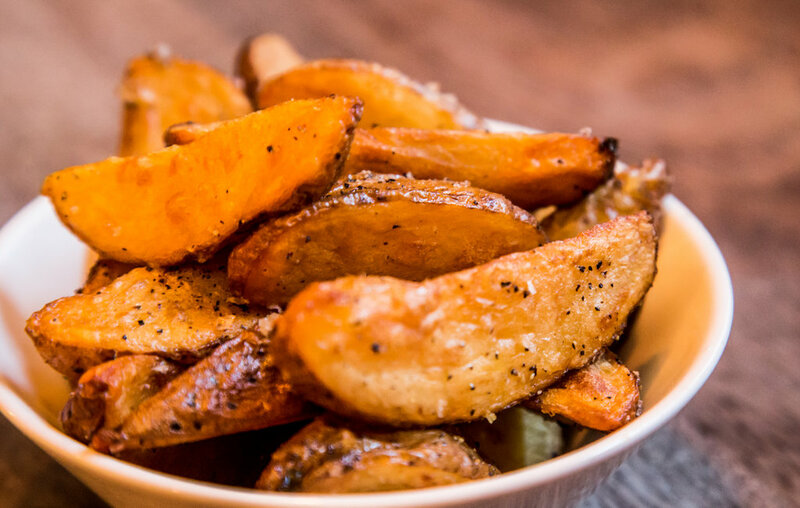 Customer favourites, the steak poutine (£10) and the mushroom poutine (£8) have been joined by fried chicken poutine (£10) and the classic poutine (£6) all served with handmade chips, cheese curds and gravy as standard. Where there used to be weekly sandwich specials, there is now a full blown sandwich section. Fat Tony is spoiling you for choice with the deli (£10) bresola, salami, mortadella, pastrami, rocket and pickle, the BLT (£8) classic bacon, lettuce and tomato, the Philly cheesesteak (£10) steak, fried onions, mushrooms and cheese sauce or the indulgent triple cheese (£8) blue cheese, smoked cheddar and halloumi. All butties are served on a poppy seed roll with fries, salad and pickles. Fat Tony’s lean, mean, green, hunger reducing machine includes a brand new salad section; get the steak and blue cheese (£8), the chicken and bacon (£8) or the halloumi (£8). Top toppings all tossed up with mixed salad and Tone’s own house dressing. 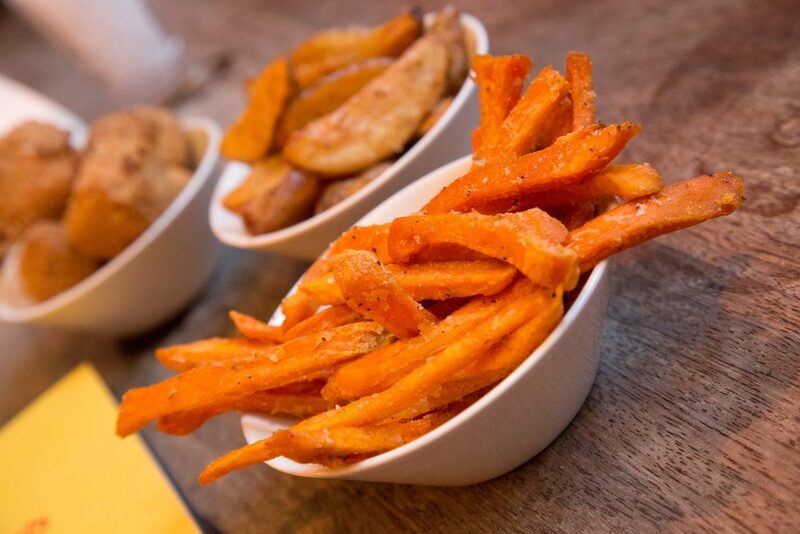 Finishing off Fat Tony’s menu is the Sides section including the fried pickles (£3), a bowl of maple bacon (£5), homemade chips (£3), French fries (£3), sweet potato fries (£4) or halloumi fries (£5). 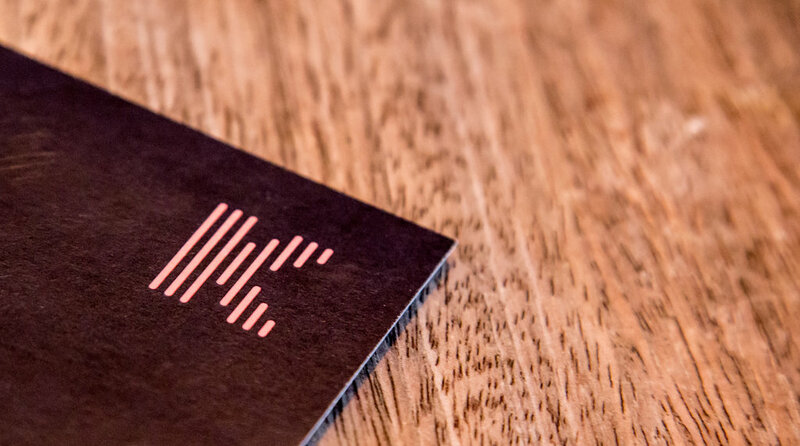 The Kosmonaut Sunday roast offering remains without change – and it is available on EASTER SUNDAY – normal opening hours all weekend. The options are veg (£10), chicken (£11) or beef (£12) all served up with roasted potatoes, honey roast carrots, savoy cabbage, a Yorkshire pudding, stuffing and topped off with a tidy helping of proper gravy – and there is a veggie version. I may have to go back and try this! It looks fantastic. For those with a bottomless pit in the mid-section (like Fat Tony) there some special extras available upon request. The roasts will now be joined by records as Tony’s pal Pasta Paul will be on the decks spinning a chilled out soundtrack each and every week. 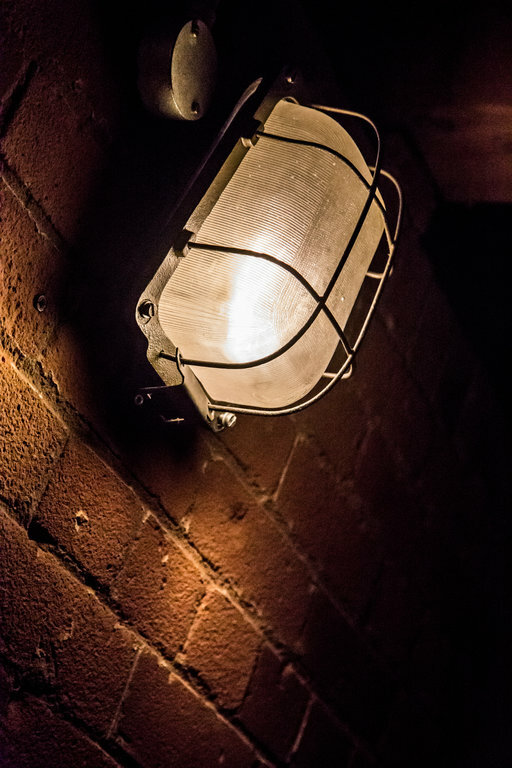 Kosmonaut General Manager Danny Smith said: “Since Fat Tony took over the Kosmonaut kitchen we have been inundated with requests for more dishes. Now, at Kosmonaut we like to give our people what they want but anyone who knows Tone knows it just isn’t that simple; we arranged a sit-down, talked things through, raised a Salute and he gave us the wink. So, here you go guys…you’re about to taste something real special”. 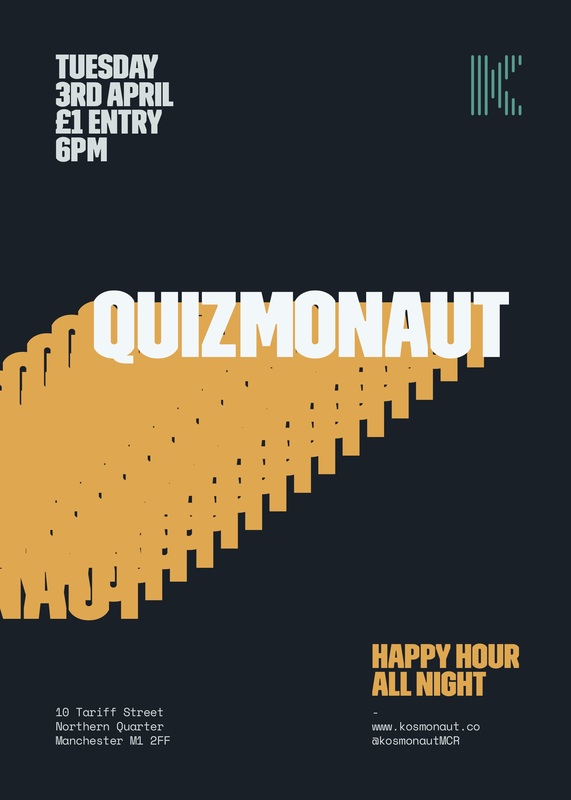 It’s £1 per person to enter the Tuesday night Quizmonaut, you will be treated to some surprises and awarding the winning team with a huge tab to spend at the bar with different 2nd and 3rd place prizes awarded week in week out, just register your team at info@kosmonaut.co. Find out more on Kosmonaut’s Facebook event page. Photos below by Elspeth Moore.